I had to re-dye the bass parts, but they look really good now, and I’m glad to say, the dying process is finally done. I realized that if I didn’t use a sealer, the (water-based urethane gel) finish that I was going to use would likely cause the (water-based) aniline dye to bleed and the finish might look cloudy, or even muddy. So I picked up some Tung Oil Sealer at Lee Valley… The sealer is already on the bass and drying as I write this article. :-) It should be ready to buff (with #0000 steel wool) in 24 hours, and then I’m going to let it sit for another 24 hours after that, to be extra sure. I’m going to see/try if I can get away (safely) with only one coat of finish on the body, especially now that there’s a sealer on the bass too…?… But since the body wood really is so soft (Agathis? ), I’m planning on two coats anyways, (and hoping I can bypass the second). We’ll see. Here are some photos of the bass with the final, final coat of dye, just before the tung oil sealer went on. I really like the look of the black neck! I received the tuners and knobs and they look great. The bass is gonna look so nice when it’s done, and I already know it’s going to sound amazing too! In fact, I’m constantly going back-and-forth on whether to just keep the bass instead, or actually follow-through with selling it… Hm. 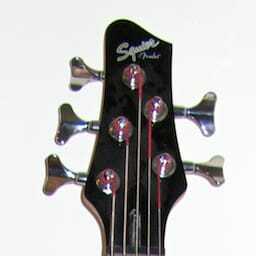 As for the bass bridge, I still haven’t heard a peep from AllParts. Terrible, terrible, terrible. But I did find a company in Calgary that’s going to dry film the bass bridge for me, as well as a bunch of screws and misc. parts for $45. Apparently powder coating the bridge, my original idea, is not a good solution since it’s too thick. Plus dry filming will allow me to do the screws too, so the color will match exactly. The bass bridge (and screws, parts, etc.) will be ready for me to pick up on Monday. :-) In the end, I think this is a much better solution to buying a new bridge anyways, since I wasn’t able to find another five-string bridge with 16mm spacing, and much less a light-weight one like this one. Again, this makes me think I should just keep the bass – it’s perfect! In terms of the electronics, I’m going to shield the electronics cavity with aluminum tape, so this should solve the "noise" issue. Not that’s it’s a big deal, I’m just extremely picky. ;-) I was considering shielding the pickups too, but there’s not enough room (the pickups just barely fit in the slots – it’s a very tight fit), plus, it’s not at all necessary with this bass anyways. don’t fix it if it ain’t broke I guess. I think it’s time for me to start thinking about what to record with this bass, and what kind of recordings to put up if/when I sell it. I’m thinking a mix of styles (in one track) would be best, but I’m not really sure what I’ll do yet. Hm. Fretless Bass Conversion… Part IV was published on Wednesday, May 6, 2009 at 4:51pm MDT by Daniel Menjívar and last updated on April 11, 2018 at 9:30pm UTC .